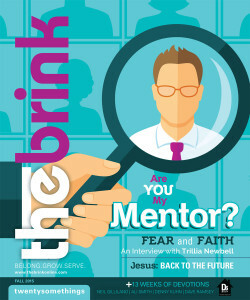 The Brink magazine is a devotional magazine for twentysomethings that challenges its readers to belong, grow, and serve. As part of D6 Curriculum, The Brink magazine contains 13 weeks of devotions, all focused on applying the issues discussed in a small group using The Brink Leader’s Pack. Not only that, but columns by Dave Ramsey, Drs. Les and Leslie Parrott, Mike Glenn, Neil Gilliland, Ali Kennedy, and Denny Kuhn give the magazine keen insight on the issues twentysomethings face. Feature articles include interviews, stories, and opinion pieces about the topics twentysomethings care about. Interested in leading a group? Check out the Brink Leaders pack.